BANGKOK (AP) -- Bargain-hunting helped Asian stock markets edge upward Monday, but gains were limited as investors remained unconvinced that the world's major economies nailed a solution to the European debt crisis following a summit in Washington. Markets posted only muted gains as traders were kept on edge by worries about the economic future of Greece and whether it would exit the 17-country euro currency union. A weekend summit in Washington among leaders of the world's most powerful nations provided little in the way of encouragement for investors already nervous about slowing growth in China and fears that turmoil in Europe could hit key export industries. Leaders of the G-8 countries issued a statement calling for both painful cutbacks and growth-promoting measures to deal with a crisis that threatens the global economy. But actual steps were left up to individual countries to take. "We saw a very weak statement out of the G-8," said Andrew Sullivan, principal sales trader at Piper Jaffray in Hong Kong. "They probably have gone as far as they can, but the market isn't interested in statements. It's interested in action." He said the next major market-moving event was likely to be on June 17, when Greeks elect a new government. At stake is a multibillion euro bailout that Greece urgently needs to stay solvent. International lenders have threatened to cancel the package if Greece fails to follow through on its austerity plans. But austerity has proven wildly unpopular among voters and led to the downfall of the prior government. Any new government that fails to enact sharp spending cuts risks being cut off from financial help that could hurtle Greece into default and toward a messy exit from the euro. In any event, sharp selling among key Asian indexes last week presented bargain-hunting opportunities. 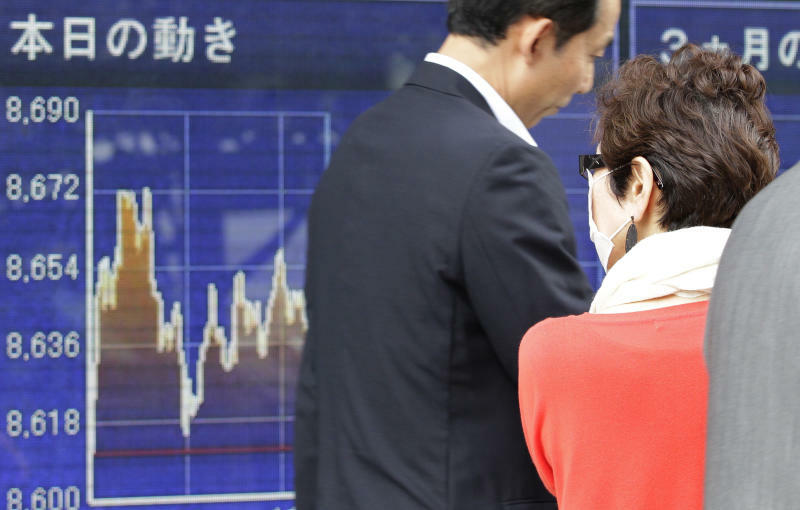 Japan's Nikkei 225 index came off four-month lows to rise 0.3 percent at 8,636.89. Nishimatsu Construction Co. added 3.9 percent and Mitsubishi Motors Corp. rose 1.4 percent. Camera and medical equipment maker Olympus Corp. rose 1.7 percent. Australia's S&P/ASX rose 0.2 percent to 4,055.90 as improving commodities prices helped its sizable resource sector. Energy Resources of Australia jumped 4.4 percent and BHP Billiton, the world's largest mining company, added 2 percent. Mainland China's Shanghai Composite Index was 0.3 percent higher at 2,351.06. Benchmarks in Taiwan and India also rose. Singapore was mostly flat. But Hong Kong's Hang Seng was down 0.3 percent at 18,893.53. Indonesia, Thailand and New Zealand benchmarks also fell. Shares of Hong Kong-listed Alibaba.com Ltd. rose 0.2 percent a day after Yahoo Inc. announced it will sell back half of its 40 percent stake in the Chinese e-commerce group. Rising gold prices helped boost Hong Kong-listed Zijin Mining Group 3.7 percent. Benchmark oil for June delivery was up 43 cents to $91.91 a barrel in electronic trading on the New York Mercantile Exchange. The contract fell $1.08 to settle at $91.48 in New York on Friday. In currency trading, the euro rose to $1.2782 from $1.2737 late Friday in New York. The dollar rose to 79.21 yen from 79.08 yen.